Often when someone comes to see me for help with a job or internship search, we first review their resume and then I ask about their cover letter. They look at me with an expression of surprise on their face and say, “Do I really need a cover letter?” My answer is a resounding “yes!” Let me tell you why. A cover letter allows you to talk about yourself and why you believe you are a good candidate for the position you are applying for, as opposed to the resume, which is mainly a factual document. It enables you to sell the reader on why they should bring you in for an interview. Last, but not least, it is an opportunity to promote yourself and your skills in your own words. Still not convinced? How about this then: I have had recruiters tell me that if a cover letter does not accompany the resume, they don’t even look at the resume. While all recruiters may not use this practice in eliminating job candidates, do you want to risk that chance? Now that I have convinced you, let’s talk a little about the cover letter. When writing a cover letter, it should be specific to each job or internship you apply for. It should discuss skills and abilities in line with the position you are applying for as well as how you believe you can contribute to organizational goals. When possible, use specific examples that exemplify skills and accomplishments. Yes, it is more work but, in the end, if it yields an interview it was worth the effort. 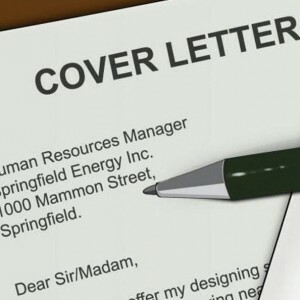 Cover letters can be intimidating. Talking about yourself is not the easiest thing to do. But once you get started, it does get easier and the more you write them, the better you will get. If you believe your cover letter writing skills are in need of a tune-up, there is a great workshop coming up that the Career Center and the Writing Center are jointly sponsoring. It will be on Nov. 12, 5:15-6:30 in Aquinas 163. You will learn the elements of a cover letter and how to right a compelling story that will convince the reader to bring you in for an interview. And the Career Center is always available to help you as well.